Winter is winding up and Spring blossom is here. Our local food market have loads of fresh green goodness, some of which I do not even know the names. This Brocolli Rabe Rapini was in demo in a near by store and my hubby liked the simply stir fry the Vendor provided flavored with garlic and dashes of lemon juice. Vendor said it is bit bitter but adding lemon juice will reduce them. I brought it home, made this Thoran, flavored with garlic, curry leaves and served with splashes of lemon juice. Adding grated coconut is optional which can reduce the bitterness too but I made it without coconut as well. I wonder where all the bitterness go, we couldnt even feel any :-) It tasted great, goes well with Rice/Roti. Try out this fresh green goodness, Enjoy !!!! · Rinse the broccoli rabe well in water and chop it . · Heat oil in a wide pan and add mustard seeds. When it splutters reduce the heat to medium and add Shallots/Onion, Garlic, Curry leaves, green chilies and salt. Saute for few minutes till onion turns translucent and garlic leaves it raw flavor. · Add the turmeric powder and sauté for few swconds. Add chopped broccoli rabe. Saute well to combine everything. · Cover and cook for just 2-3 minutes, Open the lid and sauté for few more minutes till the water is fully absorbed and leaves are soft. Make sure leaves don’t go mushy. 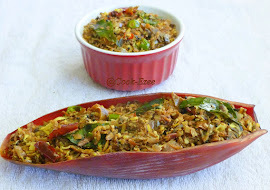 · Increase the heat to full/high and add the grated coconut and saute for another two minutes or until it is dry. Remove from heat. · Sprinkle juice of lemon when the stir fry is ready to serve and mix well. 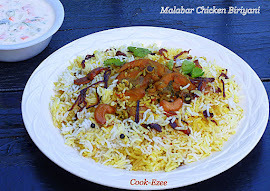 Serve warm with Rice or Roti. I have never tried, looks so fresh and healthy..
Adipoli healthy curry ,Nammal enthu kondum thoran undakki kaliyum. Excellent side dish for rice..lovely thoran.